The current chapel is within Newstead Abbey, best known for its association with the poet Lord Byron. It is entered through a doorway off the East Cloister, and is a mainly 13th Century chapel, formerly the monastic Chapter House. It is a very small rectangle with six ribbed vaults, comprising nave and chancel which is reached by three shallow steps. 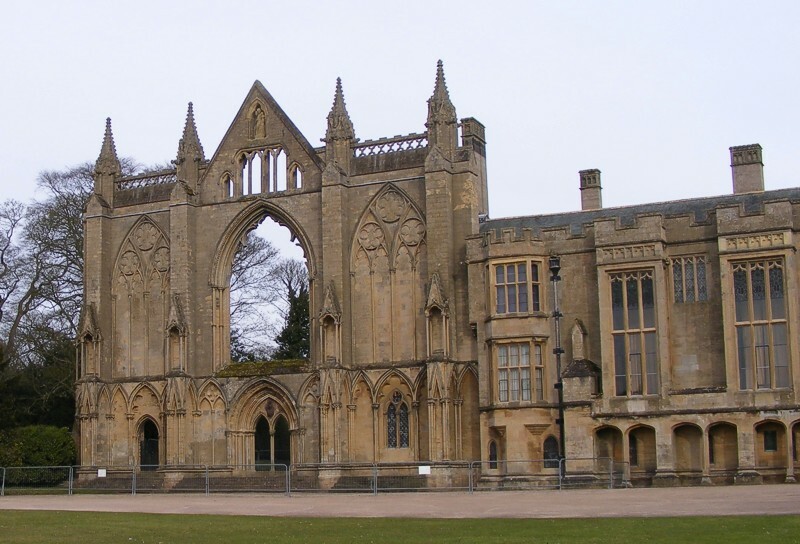 Slender stone columns in clusters support the Gothic roof. There are beautiful details on the columns and carvings of the archway voussoirs. But in lowering the cloister ceiling the Byrons covered the point of the chapel archway, which protrudes into the east gallery above. The early Byrons converted the chapel and used it as their domestic chapel. Lord Byron, the poet, housed part of his menagerie in it. Thomas Wildman, owner of Newstead 1817-60, restored the chapel in the mid-19th century. In about 1864 William Webb commissioned Charles Buckler to re-decorate it. The Gothic-revival stencilled wall painting in the style of William Butterfield dates from this period. These designs are said to be taken from illuminated manuscripts of Henry II’s reign and from decorations discovered beneath the ceiling plaster. Also from the mid-19th century is the stained glass attributed to John Hardman. One window is a memorial to Thomas Wildman. Floor tiles are by Minton and there is rich tiling within the arcade above the sedilia. The stone altar top is supported by a central stone column and slender marble ones at each corner. Seating is on oak-traceried pews. There is a tall oak lectern. The main attraction may be the wall painting, but the whole is delightful.